How was your week? 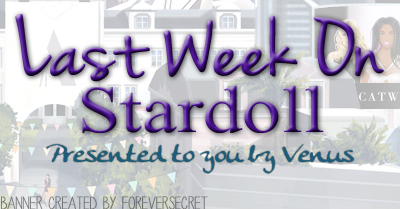 On Stardoll, it was above average, slow weeks we usually have. That's probably because of the biggest Stardoll contest starting again, or an interesting limited store getting 2nd collection. But I will discuss that as I go on with my recap. Here I go. The week started with another interior store release. (Remember, last week on the same day, we got new Villa floor.) Kitsch this time. Take a look. Now most Stardoll users were waiting for a MSW, so I don't think many were interested in a random interior stuff. Especially this store. No offense, but I really dislike this store. I know some can use some items and create fab suites, well I am not one of those people. 2 superstar only items, not that I care anyway. But not to be too much negative, the store in fact has some really interesting items. Some. And on Tuesday, we got new Rio collection. A clothing collection. Me like it. Actually, I like only some of the items. But I am wondering, why now releasing some random collection, when everyone is waiting for MSW store. (Which we haven't gotten yet.) I like the black dress with a zipper, black/pink dress, and black/gold top, which can look great paired with a pair of jeans, and maybe some gold sandals. Other items are not that attractive. Only 2 starcoin items, and not that much attractive ones. Oh, well.. 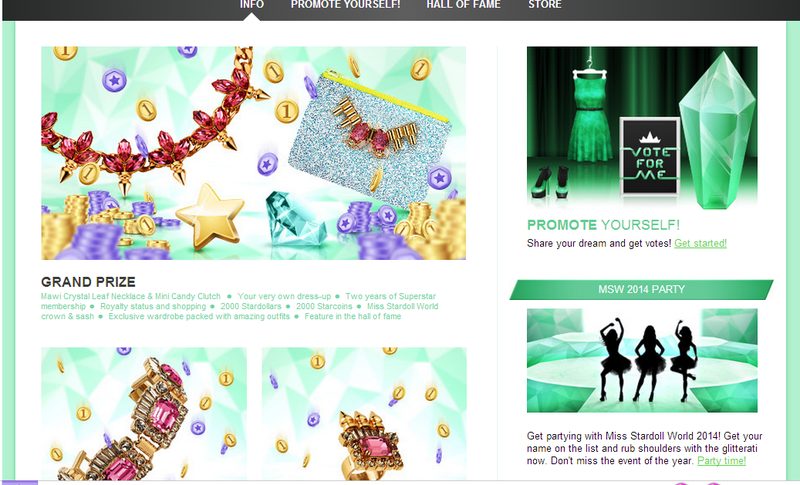 While expecting this year's Miss Stardoll World contests to start, we got a MSW themed party room. Take a look at it. The chat room looks okay. It is green, which is this year's MSW theme color. And even it is available to all members, the price just makes me stare in wonder. I mean, 12 stardollars for a chat room? I know it may not seem much, but it is just for a single chat room, which isn't that much special anyway. Maybe people can attract people to a party, and expect to get votes, I don't know..
On Friday, finally, this year's Miss Stardoll World started. The prizes for a winner ands runner ups are quite nice. Beautiful real brand jewelry, superstar/royalty membership, stardollars, etc. Even I like that the prizes are different, we gotta admit they are not that valuable as some previous ones, like, remember when the winner got an iPhone with their Stardoll name engraved on it? The rules are the same as last year's, you vote on people's suites, then when the semi finalists get announced, you vote for your favorite from your country or continent, and finally, when the finalists get announced, you vote for your favorite doll. We got some nice gifts, but honestly, I am not a huge fan of this year's MSW theme color. Even the prizes are nice,in order to win, you will probably have to spend more money than the value of the prize. Okay, maybe not. I never tried running and trying to win. I chose to get my own virtual fame some other way. People are organizing to help each other get to semis, exchanging votes, which is nice. I will be voting for a few of my friends who decide to run. It is nice, of course, even getting to semi finals would be a nice achievement, but it would take too much time and money, which I cannot afford losing, especially the 1st one. (Still studying for exams, ugh.) And besides, my country hasn't gotten their semi finals group in previous years, as they do not have much Stardoll users. I am lucky not to be superstar at the moment (well sort of), because even if I became one, I am sure (overpriced) broadcasts would attract only spammers, not starbazar buyers. I don't think many want to pay my prices and rather spend money on advertising for MSW. Okay, not that lucky, read on. The top the week, Stardoll released new Strike a Pose clothing collection. The collections is really great. The 1st one was a huge success, even it was only for superstars. This one was even bigger success, because it got sold out really quickly. Since it was announced a day before, people were ready, got their stardollars/superstar membership upgraded. Really great idea for a store, and I was sad I couldn't get it, but like I said, I wasn't interested in renewing my membership because of MSW spammers and lack of free time. I think the store is getting more popular then the Limited Edition. (Remember, it took more than a week for a last LE collection to get sold out.) And it should be. But next time I will be ready, hopefully. That's all.. wait, I wanted to mention some news that weren't announced on a blog. 1st of all, the price for broadcasts went up from 5sd to 8sd, the day MSW contests started. Nice one, Stardoll. I guess they are expecting a lot of people to try winning MSW fair way, and won't even notice the broadcast price going up for over 50%. So we can expect more gb/chat spammers, cheaters, and organized voting. So if Stardoll think they are winning, think again. Like I said, an interesting week. Now you have a hard task choosing your favorite moment. So vote, leave a nice, interesting comment. I'd appreciate that.